Working at a HubSpot Diamond Partner agency has been a great way to discover handy inbound marketing tips to improve website traffic and lead nurturing for our B2B clients. As well as learning about inbound from my fellow team members, I've found HubSpot a great source of knowledge and inspiration, thanks to it's excellent training and detailed how-to guides on improving marketing strategies. Luckily, most of these strategies can be achieved using tools in the HubSpot suite of software and, because most are quick to set up, there's no excuse not to try them for yourself. A 'pillar page' is simply a website page created around a topic, instead of a product or service. SEO-rich information from a high-value piece of content is displayed on the page, instead of behind a gated landing page to be downloaded. ‘Opening up’ this targeted content to Google will not only boost SEO and increase traffic to your site but refine the quality of leads coming through, so the sales team can focus on the real opportunities. While e-books and whitepapers can be good lead generators, a proportion of sign-ups may not be interested in anything you have to sell and therefore of no use to the sales team. A pillar page will be available for anyone to read, yet those who are truly interested in finding out more or enquiring about a service are encouraged to get in touch through the main CTA at the bottom of the page. Take a look at our own pillar page on B2B inbound marketing. 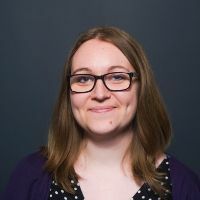 While this won’t work for every piece of content, it’s worth reviewing your most popular top of the funnel pieces and considering ungating them to really see the effects. The topic clusters tool within the content strategy section of HubSpot lets you create a visual map of how topics and pages on your site can be linked. Producing your own cluster can be a great way to plan sub-topics and blog posts to promote your pillar page. Using targeted keywords in blog posts that link to the main pillar page will enhance the visitor’s journey and connect blog content to key website pages and offers. Finding a way to promote new products to existing customers or encouraging MQLs to sign up to your service can be challenging. One simple way to engage specific groups of people is to create smart content. With this HubSpot tool, you can create targeted content, forms or CTAs that only certain people will see when visiting a page on the website. For example, a homepage may show a CTA promoting a free trial for a service, which is not useful or valuable to customers already using this service. Creating a smart CTA to up-sell a different service or offer is more likely to appeal to this group and could secure extra sales. You can create smart content based on a number of different rules, including the contact's device, geography, a specific list or lifecycle stage. You have a great landing page and an excellent offer, but what does your contact see when they sign up? Where are they directed? How do they get the download? Creating a specific page to host this content is a good opportunity to promote other offers and encourage contacts to discover more about your business as well as providing a clear and satisfactory user experience. A simple in-line message or follow-up email may no longer be enough to engage potential opportunities. Speaking of follow-up emails, when done correctly, these can be a great way to prompt contacts to get in touch or sign up to a free demo or trial. As well as providing a link to download the e-book or join the webinar, you can include information on how to get in touch. The best way to create a follow-up email is by setting one up in your landing page settings, rather than in the email section of the portal. This ensures the email is linked up correctly to the landing page. It’s also a cleaner way to organise lead nurturing and less hassle than creating a workflow each time. Follow-up emails can also separate genuine contacts from fake email addresses that bounce. Workflows work hand-in-hand with email campaigns, allowing you to send emails to different groups of people in the same campaign. A workflow will also track who opens an email or signs up to an offer. If a goal is put in place, for example, 'contact submits free trial form', anyone who signs up to this will automatically be taken out of the workflow so they don’t receive any more promotional emails. There is an option to include a ‘branch’ to schedule send-outs of different emails to specific groups of people. In the example shown above, a branch has been created to target recipients who opened the previous email as well as those who didn't. You may not necessarily want to convey the same message to both groups of people as there are different levels of interest. For those recipients who haven't opened the first 'Free Demo - TY Follow up' email, you could create a second email that uses a new subject line. This might encourage them to open the second email. And for those recipients who did open the first email, including different information or new offers in a second email may encourage them to click through to the site or move to the next stage in the customer journey. 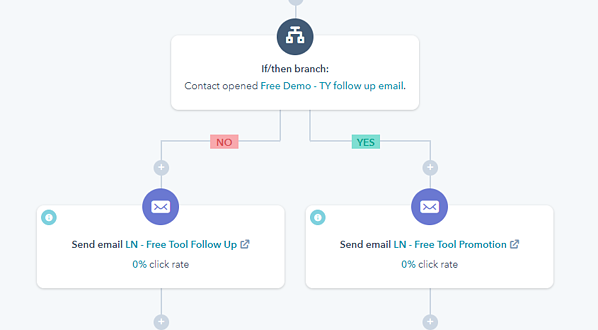 It's worth noting that a branch enables two emails to be scheduled at the same time and in the same workflow, so you can easily track campaign results. Webinars are an effective way to generate leads and drum up interest in a particular service or topic closely related to your business. They are a great opportunity to create a lot of valuable content too, including dedicated listing pages, launch posts, on-demand updates, email campaigns and even e-books. We recommend starting the campaign two or three weeks before the webinar to allow sufficient time to promote the event via email and your blog. After you've finished streaming the webinar, you can then advertise it by sharing the recording with those who missed the webinar. If the topic is evergreen, keeping the webinar gated can capture leads throughout the campaign and for a long while afterwards too. The easy-to-use HubSpot integration with GoToWebinar means you can sync up the two accounts with ease, ensuring all registrants are included in any HubSpot workflows. Attendees can also be sent webinar reminders a few days and even hours before the event so they don’t miss out. This is a quick way to test what elements of your website and landing pages increase engagement and click-through. An example of A/B testing is two variants of a form, one of which includes extra fields. Running the two options at the same time will determine whether the longer form deters contacts from signing up or if it helps you gather more detailed information. You can run A/B testing on copy, forms and images to test which approaches are most successful. Follow HubSpot's guide to set up and test your own A/B website page. 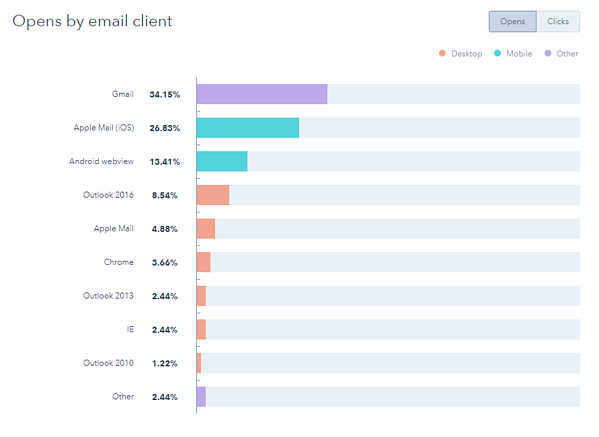 HubSpot has recently released a tool that delivers a more in-depth look into email campaign results, showing a ‘heat map’ of where recipients click. The data shows which device and email client was used by recipients when opening the email, so you can ensure any future emails are tested thoroughly on these devices and browsers. You can also compare the percentage of people who just glanced at or skimmed the email. This all helps to indicate areas worth improving or in need of more testing – so future campaigns achieve higher engagement. This is a simple, yet effective way to encourage leads to book meetings directly, without phoning up or sending emails back and forth to confirm a date and time. Once implemented, a simple ‘book a meeting’ link will show in automated emails sent out, allowing the prospect to book a meeting directly. Follow the simple step-by-step guide here. Along with the 9 tips above, there are plenty more discoveries in the HubSpot portal which can help enhance your marketing strategies and lead generation. For a bit more HubSpot inspiration, check out their user guides area which covers everything from CTAs to keywords.